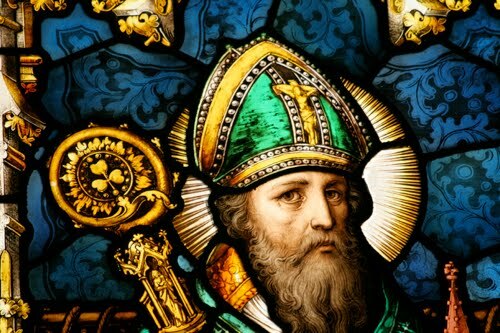 On this blessed feast -- the 1,550th anniversary of the death of the Apostle of Ireland -- the thread of this morning's gate-starter is worth returning to. Of course, such are the days we live in that, here in the States, the Vietnamese are viewed as the "new Irish," while on the Sod itself, talk abounds of "post-Catholic Ireland" (as if such a thing could exist). Even for these theories, though, the thread of Irish leadership in the church at home and beyond remains strong and significant, albeit developed considerably from the jingoistic days when the likes of Paul Cullen and John Hughes bestrode the earth. Closer to home, one son of Dublin is experiencing a ministry unlike any he'd currently find in his birthplace. At 63, Bishop Kevin Farrell heads the 1.2 million-member church in Dallas -- a fold boomed some five times in size since 1990, its average parish counting upwards of 20,000 souls. He'd build more, if only he had the priests. So for now, they're just expanding the buildings instead. With the North Texas Metroplex become the nation's fourth largest metropolitan era -- and, in a reality once unthinkable, Catholics now comprising the most sizable religious group in the Lone Star State -- the Big D is expected by many to become the seat of a third province in Texas at some point after the impending USCCB ad limina to Rome, which begins in early November. Meanwhile, back on the Blessed Soil made holy by Patrick's preaching, the archbishop of Dublin is in a fight for the church's future. That doesn't mean, however, that Diarmuid Martin enjoys unanimous ad intra support. If anything, seemingly every sector of the Irish church's Old Guard finds something to complain about when it comes to the Republic's primate. Still, not even the internal sniping can obscure the reality that, in a national square looking upon a rocked church, the media-friendly native son is Irish Catholicism's lone heeded major voice -- a standing largely due to his clean hands amid the country's epochal abuse scandals... but just as much, his drive to present the moment as God's call to clean house. 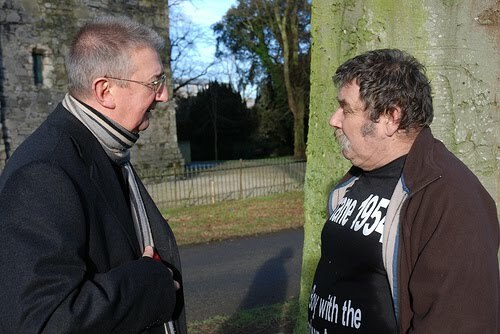 Viewed by many survivors and Catholics disaffected by the crisis as the Isle's sole leading churchman worthy of their trust -- an impression burnished further by his emotional talk at last month's public penance in Dublin's Pro-Cathedral -- the veteran Curialist recently sketched out his thoughts on the Irish church's present and future in a talk to a study group at Cambridge. The abuse scandal has deeply wounded the trust that Irish people had in the Church and it will take much effort to regain the confidence of many, right across the generations. There is no way that such confidence can be regained without the truth being revealed. Denial will not generate confidence. During these past months in Ireland we have been reflecting on the legacy of Cardinal Newman and his presence in Ireland to establish the Catholic University. Our Catholic education system is far from producing what Newman considered the characteristic of a Catholic laity: 'I want a laity, not arrogant, not rash in speech, not disputatious, but men who know their religion, who enter into it, who know just where they stand, who know what they hold and what they do not, who know their creed so well that they can give an account of it, who know so much of history that they can defend it' (The Present Position of Catholics in England, ix, 390). As Pope Benedict noted in his homily at the Crofton Park Mass at the beatification of Cardinal Newman: "The service to which Blessed John Henry was called involved applying his keen intellect and his prolific pen to many of the most pressing 'subjects of the day'. His insights into the relationship between faith and reason, into the vital place of revealed religion in civilized society, and into the need for a broadly-based and wide-ranging approach to education... continue today to inspire and enlighten many all over the world”. And the point is this: what some have called "post-Catholic Ireland" won't ever really be that. What's more accurate to say is that the Irish church's future will merely be a "post-institutional" one -- in historic terms, an evolution from the Cullen-inspired model that's been in force for 150 years. To be sure, there are those among us who conflate "institution" with Revelation. Yet wherever that mindset exists, above all, it shows a lacking grasp of history... not to mention what the church really is. Late one recent night, in the West of Ireland, two priests were sitting around, winding down the day. At 40, one was pastor of four parishes in a diocese where, due to retirements, the number of active clergy will tumble from 42 to 12 within a decade. Given the strains, the men discussed what the church's future will look like, particularly for the elderly devout who form its faithful base. As one foresaw it, "things will come to the point where the parish will be too far [for Sunday Mass], so they'll stay home, say the Rosary, and say, 'Lord, we know you want us to make it, but we can't.'" And as the other shot back, "Well, Father, that's what kept the faith alive in this country for 300 years." Sure, three centuries of that reality might be an alien concept to the faithful on these shores. Still, over many decades -- indeed, a century and more -- it's how American Catholicism began... and if that austerity could birth everything that followed, then, perhaps, there are worse ways to start anew. "This Sunday on '60 Minutes'"